Now, if there were an Olympics for destroying, mismanaging and misappropriating then Mugabe’s administration would take the gold, world-records for violations of human rights, rule of law and the constitution. The clueless regime is busy scheming how to stay in office beyond 2018 to continue to plunder our resources, spend our children’s inheritance and finish out the little remaining of our economy. We cannot afford another Mugabe’s administration beyond tomorrow. Everyone has the right to be stupid, but for Mugabe and company to be abusing the privilege by borrowing trouble then lending it to us has now become unacceptable even with some of his own. 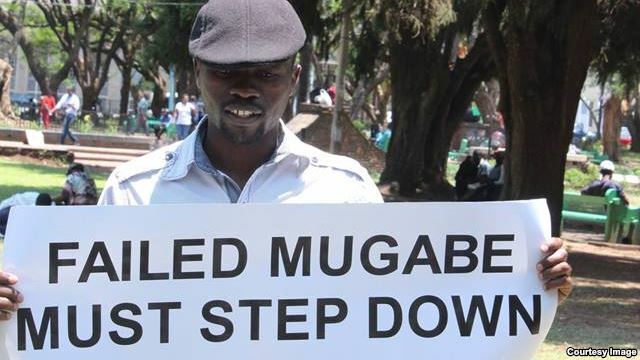 The egoistic and seemingly unbalanced War Veterans who were champions of celebrating Mugabe’s mediocrity have abandoned and disowned their big-headed patron and master of destruction. It is a fact that when two egotists meet, it’s an eye for an eye. The recent fallout and the subsequent wanton throwing of big words at each other between the 2 self-seeking groups made of War Veterans and one led by the decrepit Mugabe is a very good opportunity for us to finish off the rogue regime and all its surrogates. As skirmishes reaches the peak with the foolish parties fighting each other with burning logs, we have to rush with gallons of the most flammable substance and hand as many as we can to each of the combating cabals of idiots. This way we are so sure that the fools will barbecue each other and will only have themselves to blame. We should also not let the mood that had engulfed the people during the last weeks to simply die down before we have achieved the ultimate objective of having Mugabe and company vacate Government offices. We should ratchet the pressure on Mugabe administration to take the road and make dust by increasing our civil defiance campaigns. A hodgepodge of such campaigns will definitely yield the desired outcome at the same time taking advantage of the fallout in ZANU PF.